Leez Priory is a highly sought after, Tudor mansion wedding venue situated within the heart of the Essex countryside. The venue is surrounded by 40 acres of parkland, swans, and a sweeping driveway. In addition, the incredible team at Leez Priory have over 25 year’s worth of wedding planning experience enabling them to make sure you have the wedding of your dreams. In addition, with a choice of seven licensed, exclusive ceremony settings, your day can really be personalised to your needs and wants. For overnight accommodation, 15 stunning rooms are available. The Fisherman’s Cottage, tucked away overlooking the lake, is available to the Bride and Bridesmaids to stay the night before your big day allowing you to wake up revived and refreshed ready for your special day. Explore Leez Priory here. Set in the heart of the Essex countryside, with stunning scenery and a rustic interior; The Compasses prides itself on the fact that it is not a conventional wedding venue. Quite simply, when you host your wedding at The Compasses it really is yours for the day and yours to shape into your own. This stunning venue is run by a close knit family team dedicated to ensuring your dream wedding. Additionally, the wonderful chefs are incredibly flexible and can offer formal 3 course meals or less formal BBQ’s, and paellas. The Compasses also has an impressive dining and ceremony capacity of 120 guests, a fully licensed bar, exclusive use, and pets are welcome! Explore The Compasses at Pattiswick here. Gosfield Hall is a stunning Georgian manor house nestled in a village location among the beautiful Essex countryside. Although it is located in the heart of rural Essex, it is only 30 minutes from Stansted Airport. This former royal residence as an abundance of settings and features that are guaranteed to create the most perfect backdrop. The Queen Charlotte’s Oak panelled gallery with 120ft long aisle is perfect for wedding ceremonies as is the stunning Grand Salon with its ornately decorated ceiling. The licensed carriageway allows couples to enjoy an outdoor ceremony on sunny days with the striking house as their backdrop. The Marquis of Buckingham’s former ballroom provides an exquisite setting for the wedding breakfast for up to 116 guests and there are several other grand and elegant reception rooms for your guests to enjoy. Gosfield Hall has an impressive dining and ceremony capacity of 116, in house catering, and accommodation for up to 67 guests. Explore Gosfield Hall here. Hedingham Castle is a truly exciting and romantic wedding venue. 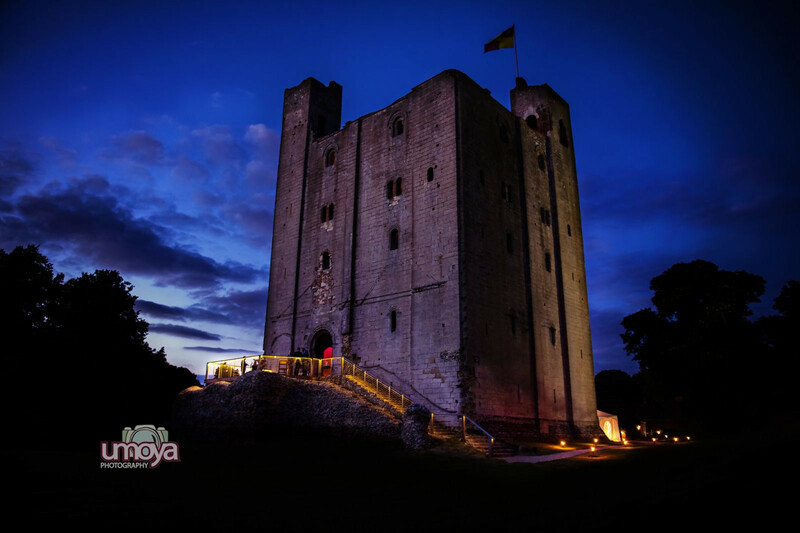 Ceremonies at Hedingham Castle, for up to 130 guests, take place in the Banqueting Hall of the 900 year old Norman Keep, in a setting of great beauty and solemnity. In addition, the Georgian Mansion House and a fully equipped Marquee provide the perfect setting for a magical day. For accommodation, The Garden Cottage, nestling in the Lord’s Orchard, is provided for the bride to prepare in and for the use of the newlyweds on their first night together. In addition, an 8 bed lodge is available. The castle offers a ceremony capacity of 130 guests and a dining capacity of 150 guests. Explore Hedingham Castle here. With 12 magnificent rooms, Maison Talbooth country house hotel is an exquisite venue for smaller weddings. Located in Essex, surrounding views include Constable’s Countryside and the Dedham Vale. Maison Talbooth is perfect for couples who are after a small, intimate wedding with a ceremony and dining capacity of 50 guests. In addition, Maison Talbooth offers a gorgeous in house spa for the couple and guests to pamper themselves before and after their big day. Exclusive use of Masion Talbooth includes all 12 Bedrooms, Lounge, Garden Room, Outdoor Heated Pool, Hot Tub, Tennis Court, the stylishly designed Pool House and Landscaped Gardens! Maison Talbooth us a truly glamourous location for you and your nearest and dearest. Explore Maison Talbooth here. Marygreen Manor is a Tudor Manor House set in beautiful grounds which provide the perfect backdrop to your special day.The tastefully decorated Samuel Pepys Room is fully licensed to hold your Civil Ceremony or Partnership. With high ceilings and large picture windows adding to its overall elegance and charm, it's the perfect setting in which to celebrate the beginning of your new life together, in the company of your family and close friends. The Henry VIII Suite is ideally sized for your Wedding Breakfast with original Tudor oak beams. Marygreen Manor Hotel has. Ceremony capacity of 90 guests and a dining capacity of 120 guests. This historic venue also offers in house catering. Explore Marygreen Manor Hotel here. That Amazing Place is an exclusive use 15th Century Country Manor House set in stunning surrounds and with accommodation for up to 25 guests. Dating back to the 15th century, this historical grade II listed manor house has been beautifully renovated with stylish, contemporary interiors and elegant furnishings, offering a cosy and imitate “home from home” in which to welcome and entertain your guests. That Amazing Place is fully licensed to carry out indoor and outdoor civil ceremonies. In addition, this venue has a ceremony capacity of 100 and a dining capacity of 150 guests. A lovely added bonus is that pets are allowed! Explore That amazing Place here. The combination of an elegant Georgian house and the imaginative conversion of an old chapel make the Hallmark Prince Regent a unique wedding venue. The team at Hallmark Prince Regent are dedicated to ensuring the highest standard of service in order to make sure every detail is perfect for your big day. In addition, the Hallmark Prince Regent is licensed to hold wedding and civil partnership ceremonies, enabling your whole day to be hosted at our hotel. This stunning venue offers a ceremony capacity that ranges between 125 – 350 guests and a dining capacity of 300 guests in addition to the availability of in house catering. Explore Hallmark Prince Regent Hotel Chigwell here. Situated in the beauty of the Essex Countryside, Maylands Golf Club provides an exquisite backdrop to your wedding. Celebrating such a special day with all your guests in the 200-year old barn, with its original exposed beams and personal service, is an effortless pleasure. The amazing team at Maylands Golf Club will be on hand to make sure your day goes smoothly and can help you choose everything from your food, to your photographer and flowers. This gorgeous venue is also fully licensed to carry out indoor civil ceremonies. In addition, Maylands Golf Club has a dining capacity of 110 and a ceremony capacity of 150 guests. Explore Maylands Golf Club here. High Barn is a beautiful Grade II listed barn nestled in the historic village of Great Bardfield, near Braintree in Essex. High Barn rightfully describes itself as a quintessentially English venue boasting stunning original features such as rustic timber framed walls and vaulted ceilings. Nestled into the gorgeous Essex countryside, High Barn is a perfect wedding venue for couples after genuinely beautiful backdrops. Wedding hire of High Barn also includes your own personal event manager meaning every detail of your big day is handled professionally, to the highest standard, and with minimal stress. Additionally, High Barn has a ceremony capacity of 250 guests and an impressive dining capacity of 180 guests. Added bonuses include fully ceremony licensed, a licensed bar, and exclusive use. Explore High Barn here.